Leave it to pro-statehood and GOP darling Luis Fortuño to conveniently stop being a pro-US-statehooder during the London Olympics. The last few days, Fortuño, who is facing a tough re-election this November, has suddenly become one proud boricua during Puerto Rico’s Olympic efforts. Never mind the fact that as someone who fervently supports Puerto Rico becoming the 51st state of the Union, Fortuño knows that in a tough election year, you got to wrap yourself around the Puerto Rican flag and overlook your political principles. We will got out on a limb and say that if Puerto Rico were to become the 51st state of the United States, it would no longer be an Olympic country, but what does that matter less than 100 days before an election? The irony of a passionate pro-statehooder like Fortuño now sounding like the other pro-commonwealth and pro-independence candidates he has criticized for exploiting Puerto Rico’s unique boricuaness is quite telling. 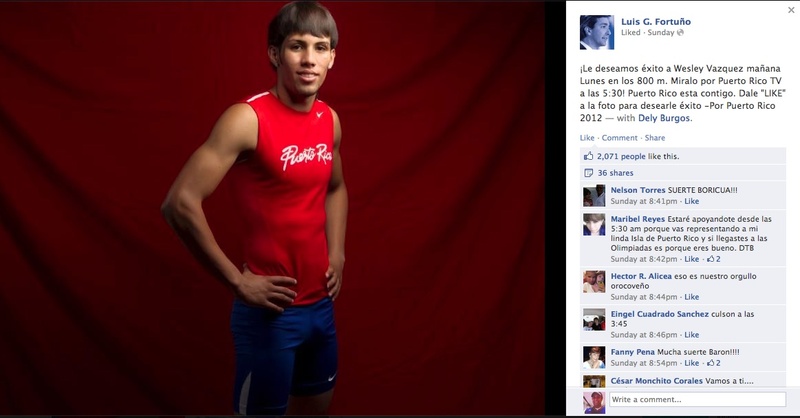 First off, change your Facebook Page cover image to exploit a picture of you and the family of bronze medal winner Javier Culson. Umm, the little girl to the right of Fortuño looks absolutely thrilled to be next to the governor. Then post your first Culson pic. Post another Culson pic an hour later. Go viral. 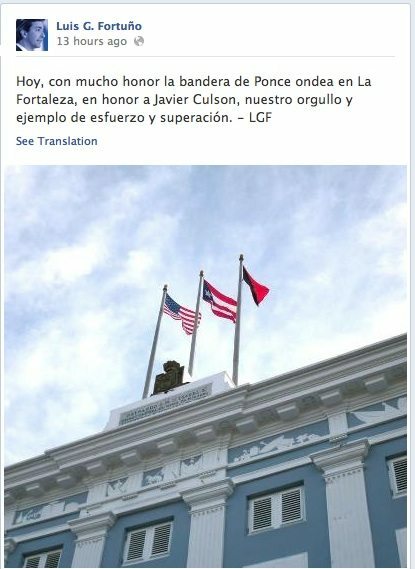 Then an hour later, raise the city flag of Ponce (Culson’s hometown) over La Fortaleza, the governor’s mansion. Here is the hypocrisy: Fortuño is head of a statehood party (the New Progressive Party, or PNP) that wants to become a state of the Union, no ifs, ands, or buts. However, if Puerto Rico were to become a state, there is no more Olympic team for Puerto Rico. 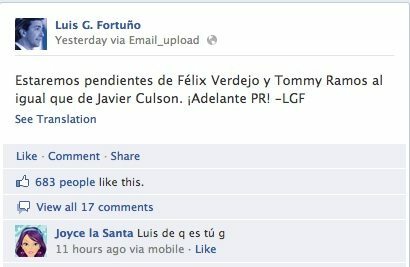 This hasn’t stopped Fortuño and his campaign from pushing Olympic pride the last few days. Talk about being inconsistent in your messaging. In addition, many PNPers who have commented on these Fortuño posts and the posts of the PNP think that if Puerto Rico were to become a state, the Puerto Rican Olympic team would still continue because there is an Olympic charter. Yeah, right. Memo to the PNPers: the United States trumps you on your desires to keep the Puerto Rican Olympic team intact. All this boricua pride and flag waving would go away. Puerto Ricans would become part of the US team, and give or take a Culson or a few boxers, the chances to make the bigger team would be slim. If Fortuño were truly the pro-statehooder that he was, he would be pushing the US team’s feats to his followers. But that would not make any political sense, since it is clear that even Fortuño will admit that when it comes to being politically convenient, it is best to push the boricuaness to the masses instead of staying true to his statehood message. But, hey, fuzziness is all part of Puerto Rico’s politics. We do find it amazing that many on the island buy it because it is coming from Fortuño. Are you ready to do that? Are you?